Dan Fergueson, Director of College Activities and Greek Life, reading Friday Night Lights: A Town, a Team, and a Dream, by H.G. Bissinger. Dan Fergueson (Director of College Activities and Greek Life), reading Friday Night Lights: A Town, a Team, and a Dream, by Buzz Bissinger. 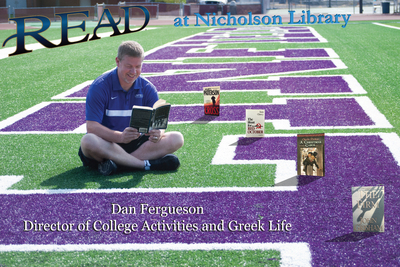 Armstrong, Lige and Nicholson Library Staff, "Dan Fergueson READ Poster" (2015). READ Poster Gallery. Image. Submission 147.